One exception aside, I honestly adore and admire every single release done, until now, by French top-label Les Acteurs De L’Ombre and their sub-label Emanations. So I was quite aroused when I did receive an untitled split-album, compiling material by three French acts that surely suit to the roster they’re on right now. I was trusted with one of them, hailing from the internal outback from pre-Alpine France, In Cauda Venenum. I used to write a review on their debut album Alpha Omega, also released via Emanations; the review was posted on December 24th 2015, by the way. Heir is a name I did hear from before, and Spectrale are new to me, so all this made me quite enthusiastic and thrilled. Anyway, the three projects involved are quite diverse, yet then again they surely sort of ‘click’ together as well. The album, which has a total running time of fifty minutes, is more than just a split, and each song is like put on the album the ‘ad random’ way – not band 1, then band 2, and finally followed by the third one, doing their own thing. No, there is sort of thought about it, I think, with a diverse yet quite coherent result as, eh, as result… I’ll bundle my ideas and impressions band by band, coming up next. The split starts off with Sagittarius by Spectrale, a project consisting of Jeff Grimal and Jean-Baptiste Poujol (the latter took care of the mix too, by the way). It’s quite disturbing at first listen, for the listener might be aroused to expect something – which does not come (not yet, at least). Sagittarius is like an introduction to a greater means, like a sonic translation of vision, both visible and hidden for us – though the Inner Eye might see the deeper dimension. It sort of explains the ideas by mastermind Jeff, for he is not only a musician, yet a graphic artist and painter as well (cf. the many album cover drawings he did, and still does). So, this song is like an aural creation that grows, starting from a chilly soundtrack of despair, up towards more orchestral layers of semi-horrific, even Lovecraftian, obscurity. Only guitars and some samples and sounds, but it’s so overwhelming and breath-taking. Track four, Al Ashfar, is a Spectrale piece too, acting like a strange yet atmospheric and ambient acoustic / semi-acoustic guitar-based creation, divided in an ethereal second half, and a more up-tempo, even Indie-Noise alike second one, before ending, at the very end, in a same manner as the first part. It’s quite up-tempo, trespassing the borders of ‘traditional’ acoustic performances. Quite in the same vein, yet differing as well, is their third contribution, Crepuscule. I do hear some elements from Americana, though that has to do with some acoustic melodies. It’s a short piece that colours the atmosphere, without taking the leading role. Yet still I think it’s a nice intermezzo on this intensive split. The second track is Descent by Heir, a five-piece from the Toulouse-area. Totally in the vein of the label they’re currently on, this is not just a Black Metal outlet, yet rather a naturally-born symbiosis of Post-Black, Post-Rock and Sludge. There is so much to experience, for there is a permanently present thrill going on. Semi-acoustic parts, blackened chainsaw-blasts, sludgy grooves, hypnotic leads, and so on; complexity is a keyword within this band’s raison d’être. But above all, they are able to remain credible. The technical skills are incredibly well-thought, yet one needs to endure, to get through the surface. But you’ll be pleased by the intelligence behind the concept for sure, because this mélange of sequacious elements truly intrigues. With Upon The Masses (track number five on this untitled split), Heir immediately smash and conquer. This piece smoothly balances in between melody and heaviness. The melody is a permanent factor that characterises the core of the song, focusing on spheres like mysticism, mystery and hypnosis. That’s a typifying element courtesy of Heir, not different right here. The heaviness I mentioned is, well, that’s quite clear too, I guess. Many excerpts are quite intense and overpowering, brutalising the inherent tranquillity that might appear once in a while. On top of it, this quite lengthy track (almost ten minutes of duration) is, like we’re used to, enormously varied, with breaks, tempo-changes, melody-interruptions and so much more, every couple of seconds. But that overwhelming overload on structural principles comes with such an organic flair, and that’s a characterising surplus for Heir. Sectarism, the album’s closing composition, and the third dues for Heir, is like a mighty homage to the international scene. Once again being enormously divers in all aspects, this particular song offers the audience about everything that thrills and intrigues. I won’t sum up all details, all elements, all ingredients that are united under the Sectarism banner, but once again you will surely be subject to marvel and wonderment. It’s quite incomprehensible how easy it seems to compose such mass on sonic layers in such evident way. Forget the tradition of Black Metal, ignore the existence of Post-Metal, for this song defines the 2.0 future of the New Metallic Age (sorry, sometimes I can’t control myself…). In Cauda Venenum firstly impressed me enormously in 2015 with their self-titled full length debut. In case of interest, you might visit the review on that album on the update of December 24th 2015 (just enter the band’s name in ‘search’ and enjoy undersigned’s thoughts on that recording, as mentioned above). This duo is presented with one sole composition on this split-album, called Laura Palmer, Agonie À Twin Peaks. As stated by both band and label, it’s like a tribute to this cult-series at the one hand, and especially to Catherine E. Coulson, the actress who performed the mysterious character Margaret ‘The Log Lady’ Lanterman, you know, ‘my log saw something that night’, or ‘my log does not judge’, or ‘I do not introduce the log’, and so on (yeah, I’m a big fan of this visual masterpiece!). 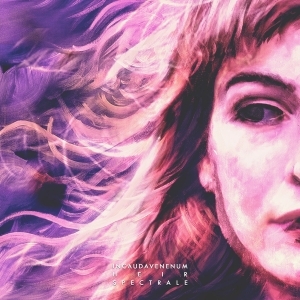 Laura Palmer, Agonie À Twin Peaks is a reinterpretation of the movie score, originally written by Angelo Badalamenti. Almost fifteen minutes of spherical, mysterious, mesmerizing ear-candy, that’s what this version stands for. And be honest: would you even expected to hear a totally blackened interpretation of such classic soundtrack? Nop, neither did I. remarkable too is the use of cello, which surely comes as a surplus on top of the whole experience (and just FYI: this cello has been performed by Raphaël Verguin, active in combos like Xevnnizh or Psygnosis). There is quite a lot to experience during this quarter of an hour, including tens of changes in tempo, structure and melody, and the injection of samples, a main quote taken from the original series, narrated by The Log Lady as an introduction to Twin Peaks. Captivating it is!